It has eight vessels and six poles, with six vessels and six poles back and other two vessels in front. The head part of the instrument can be artificially turned over smoothly and flexibly. The basket units and paddle units are made of imported stainless steel (SUS316L). The magnetism-pumped circular water current can heat the system evenly, and the bath liquid can achieve an equal temperature. 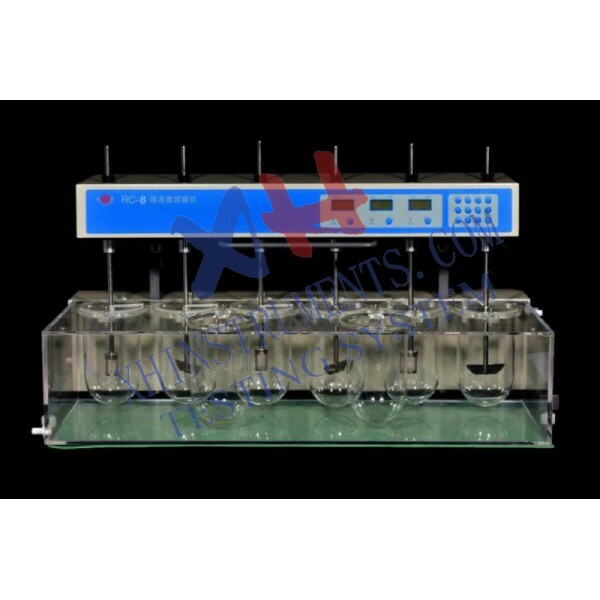 A MPU is used in dissolution tester to automatically control the temperature, rotational speed and time, and the parameters can be preset at any time. It can be operated conveniently by keystroke. The measurement result is displayed by LCD display. The preset and real data can be displayed alternately in time. It can test by self and alarm automatically. The dissolution parameters of' Chinese codex 2010' are stored in and can be taken out at anytime. Time can be preset at many points. The beeper sounds automatically to any point, and then the tester automatically runs to the next one.